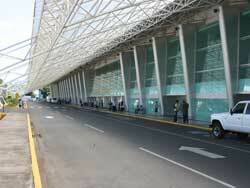 The international airport of Managua is located in the east area of Managua (Aeropuerto International Augusto C. Sandino) that links the country with others principal airport of the carriben area and the world. It has been restructured recently and it offer to passengers services of good quality. Now it is linked with: Miami, Guademala, San Salvador, San José, Panama, Huston, Atlanta and Fort Lauderdale. The official site is has a page that is continuosly being updated with the time of departures and arrivals. 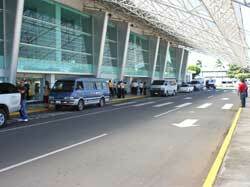 By means of the best Managua airport transfer service, our NicaTour staff will be happy to receive you at the airport and take you to Granada and other Nicaraguan city destinations, including Leon, San Juan del Sur and San Jorge, among others. The airport offer links with all the city on the Atlantic coast: Bluefields, Corn Island, Puerto Cabezas and to San Carlos. For more information about those flights look at this page. In Front of the principal building the is a large parking for cars and autobus, it's C$20 per hour per car, for Vans or Micro bus C$50 per hour.